The Sony A9 is the company's new flagship full-frame compact system camera for professionals. Aimed predominantly at sports, action and event photographers, the new Sony A9 can shoot continuously at 20fps for up to 241 RAW / 362 JPEG images with no blackout between frames, and has a whopping 693 focal plane phase detection AF points that cover approximately 93% of the frame. It also features the World’s first full-frame stacked CMOS sensor offering a resolution of 24.2 megapixels, built-in 5-axis optical image stabilization providing up to 5 steps faster shutter speed of correction, an ISO range of 100-1200 that is expandable to 50-204800, 4K video recording which uses full pixel readout without pixel binning to collect 6K of information, the latest BIONZ X processor, a top shutter speed of 1/32,000 sec, uncompressed 14-bit RAW files, a Quad-VGA OLED Tru-Finder with approximately 3,686k dots and a magnification of 0.78x, a weather-resistant magnesium alloy design, an all-new battery with 2.2x the capacity of previous Sony full-frame models, an Ethernet port for file transfer, dual SD card slots, and built-in Wi-Fi, Bluetooth and NFC compatibility. The Sony A9 retails for approximately £4,500 / $4,500. 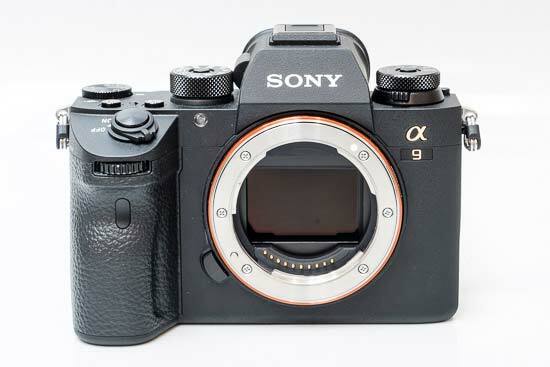 The aluminium bodied Sony A9 is visually very similar to the A7R II camera, measuring 126.9mm x 95.6mm x 63.0mm and weighing 673g (91g more than the A7R II) without a lens, battery and memory card fitted. The A9 has a slightly deeper handgrip. We found it easy enough to get to grips with the A7R II, but the new grip on the A9 makes for an even more secure hold. The shutter release button sits in a logical position on top of the handgrip, with a command dial conveniently located on the front. Also located on the front of the A9 is the newly reinforced lens mount which now features 6 screws rather than 4, and a small porthole on the left for the self-timer/AF illuminator. 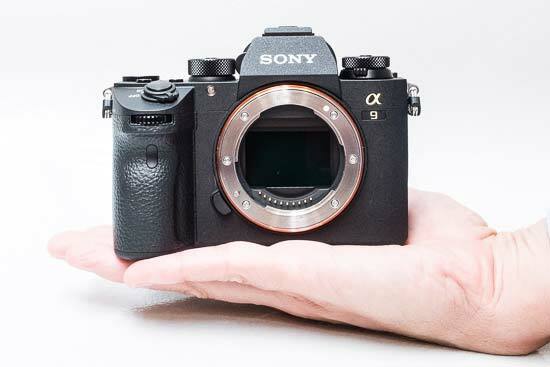 The A9 is the latest Sony full-frame camera to feature optical 5-axis image stabilization. Most image stabilization systems compensate for camera shake by correcting yaw and pitch. Sony claim that camera shake is actually caused by five different kinds of motion, and their image stabilization mechanism additionally corrects for horizontal shift, vertical shift and rotary motion (rolling) for both still images and movies. The A9 now offers an improved 5-stops of compensation, which is very impressive considering that the A9 has such a large sensor. Furthermore, the in-body system ensures that the A9 can stabilize all kinds of lenses, not just those with the FE designation, including E-mount lenses without Optical SteadyShot (OSS) and A-mount lenses as well, although third party lenses without any electronic contacts only benefit from three axes of compensation, and you need to input which focal length you’re using. On top the A9 has an external hotshoe, dubbed the Multi Interface Shoe, for attaching one of a range of accessories, including an external flash. Thanks to its electronic front curtain shutter, the A9 has a sync speed of 1/250th sec, making it well suited to flash-based portrait photography. Turn the On/Off switch on the top plate and the Sony A9 readies itself for action in under a second. The adequately sized shutter-release button has a definite halfway point, determining focus and exposure with a bleep of affirmation and focus points highlighted as green rectangles on the LCD. When you do fire the shutter, it's very quiet, and there's also a true silent mode too. The A9 uses a hybrid AF system which employs both phase-detection and contrast-based auto-focusing, with no less than 693 focal plane phase detection AF points that cover approximately 93% of the frame. 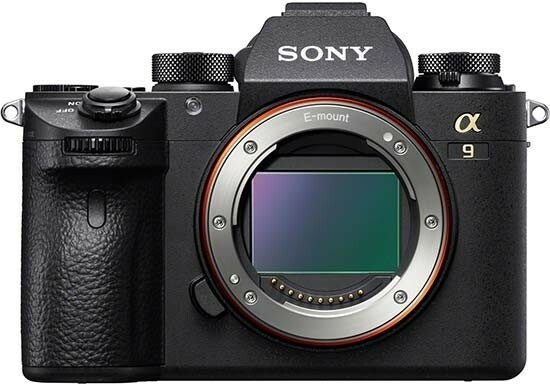 The A9 is 25% faster than the A7R II according to Sony, which in practice means that you'd be hard-pressed to notice any difference between the A9 and a comparable DSLR or a class-leading compact system camera like the Olympus OM-D E-M1, making it easily the fastest A-series camera to date. The new 693-point focal plane phase-detection AF system on the A9 works very well with non-native lenses, including both Sony A-mount lenses when they are mounted on the camera using an LA-EA3 or LA-EA1 mount adapter, and a wide variety of third-party lenses via a suitable adapter. Note that Eye AF, which can be used in conjunction with the AF-C mode, is only available with native lenses. When you choose to manually focus, a distance scale is displayed along the bottom of the LCD screen, MF Assist can be turned on to magnify the image and help you get sharp results, and there's also the a convenient Peaking function that highlights sharply-focused areas of the image on the LCD screen. Go on to take the shot and JPEG or Raw images are quickly committed to memory in a single second, the screen momentarily blanking out and then displaying the captured image before the user can go on to take a second shot. The A9 has a brand new vibration free, fully electronic, completely silent anti-distortion shutter with absolutely no mechanical mirror or shutter noise, a very welcome improvement. The new shutter also offers an impressive cycle durability of approximately 500,000 shots, comparable to most pro-level DSLRs. The Silent Shooting mode does exactly what its name suggests, taking the picture quietly without any sensor vibration or movement via the new all-electronic shutter. A round shooting mode dial with a knurled edge and positive action is also located on top of the camera with a locking button at its centre, which is a little annoying in practice as you need to use two fingers to change the shooting mode. Despite being a camera aimed firmly at professionals, Sony has still included Intelligent Auto scene recognition via the AUTO setting. Simply point the A9 at a scene or subject and the camera analyses it and automatically chooses one of a number of pre-optimised settings to best suit. In addition to the regular Program mode, which provides the full range of camera options and additionally allows you to change settings like the ISO speed and metering, the welcome inclusion of Aperture-priority, Shutter-priority and fully Manual modes lets you independently set the aperture and shutter speed, making the A9 instantly appeal to the more experienced photographer. The ability to choose from 30-1/32000th second shutter speeds opens up a lot of creative potential. There's also very welcome support for the RAW file format, which is really the icing on the cake for serious photographers, although we don't like the fact that you still can't capture Extra Fine JPEGs and Raw files at the same time. Three Custom modes on the shooting mode dial allow you quickly access different combinations of settings. Also located on the top of the A9 is a prominent dial for setting the Exposure Compensation (-+3EV) and two small buttons marked with C1 and C2, which as the names suggest can be customised to access one of the camera's key controls. The Sony A9 can shoot and record 4K video in multiple formats including cropped Super 35mm to reduce moire and the full-frame format without any pixel, using uses 20MP on the sensor (6K equivalent) and downscaling it to 4K. The Sony A9 can output uncompressed UHD 4K, 3840 x 2160 pixel video (30p/24p/25p) at a 4:2:2 color depth without downsampling to either the inserted memory card or over HDMI to compatible third party recorders. The A9 also supports the XAVC S format, which is based on the professional XAVC codec. In addition the camera can record Full HD at 120fps at up to 100 Mbps, which allows footage to be edited into 4x or 5x slow-motion files, with a new S&Q mode (Slow and Quick motion) on the shooting dial providing selectable frame rates ranging from 1fps to 120fps. There's the ability to change the EV level, white balance, metering, ISO speed, DRO/HDR, creative style and picture effect, plus various audio recording options. If you set the shooting mode dial to Movie, you can also choose from Program, Aperture or Shutter priority and Manual modes, giving you full control over exposure for both stills and movies. The clean HDMI output from the camera also allows video to be viewed on an external monitor or recorded on another device. High-resolution still images can be displayed directly on a 4K television, offering four times the detail of Full HD. The A9 incorporates extensive customizable color and gamma controls, offering the ability to adjust the gamma, black level, knee, color level, and more, but very strangely the Picture Profiles S-Log modes that are found on high end Sony Cinema cameras and the A7S II / A7R II cameras have been completely omitted from the A9, instantly making it less appealing to serious videographers. The Sony A9 has a new electronic shutter that allows it to shoot full-resolution 24.2 megapixel JPEG or Raw images at up to 20fps with continuous AF/AE tracking for up to 362 JPGs or 241 compressed RAW images, an amazingly fast rate for a 35mm full-frame camera, and all in complete silence too with no blackout between each frame either on the EVF or the LCD screen. There are also slower 10fps and 5fps settings too, all found on the new lockable stacked dial located to the left of the viewfinder, which also lets you choose the focus mode. If you choose to use the mechanical shutter, the fastest continuous speed if 5fps. On the back, instead of the bulky optical viewfinder of a conventional DSLR, the Sony A9 has an electronic viewfinder. The Quad-VGA OLED electronic viewfinder on the A9 has been further upgraded to offer a large 0.78x magnification, 100% field of view, and a staggeringly high 3,686k dot equivalent resolution, resulting in a display that's virtually indistinguishable from a more traditional optical viewfinder. 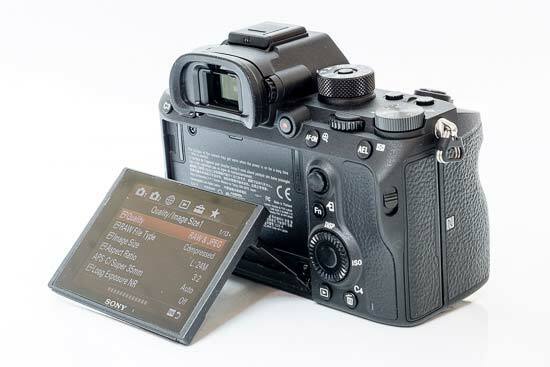 As the EVF is reading the same signal from the image sensor as the rear LCD screen, it can also display similar information, with a choice of five display modes. For example, you can view and operate the A9's Function Menu, giving a true preview of the scene in front of you and quick access to all the key camera settings while it's held up to your eye. The various icons used to represent the camera settings are clear and legible. The icing on the viewing cake is the clever built-in eye sensor, which automatically switches on the viewfinder when you look into it, then switches it off and turns on the LCD monitor when you look away. The A9's EVF system also performs very well indoors in low light, typically the scourge of most EVFs which have to "gain-up" to produce a usable picture, resulting in a noticeably grainier picture. The A9 doesn't suffer from this unwanted effect at all, making its electronic viewfinder the equal of and in many areas better than a DSLR's optical viewfinder. The truest testament to the A9 is that we almost exclusively used it by holding it up to eye-level, something that we wouldn't do unless the EVF was of sufficient quality. There's also a 3-inch, 1,440K-dot resolution White Magic panel LCD screen which can be tilted up to 41° downwards to shoot over crowds or up to 107° upwards and comfortably used outdoors even in harsh sunlight, although it still can't be rotated to the side. 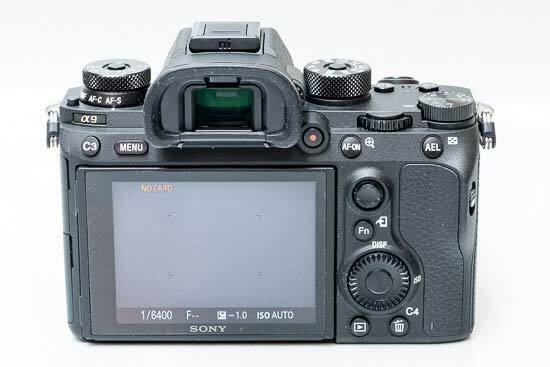 Sony have finally added touch sensitivity to the screen, which makes functions like focus point selection easier and more intuitive, offering the same options as the A6500 camera, and it even works while looking through the electronic viewfinder. Located above the LCD screen and to the left of the EVF are the C3 and Menu buttons. Press the Menu button and a number of shooting and set up folders appear on screen, with white text on a black background aiding visibility. The A9 uses the same newly revised menu system as the A6500, which is clearer and easier to navigate than on the previous A7 cameras. By default the C3 button allows you to change the Focus Mode, but as the name suggests it can be customised to another function. Immediately to the right of the viewfinder is a useful one-touch movie record button and then the second rear control dial. 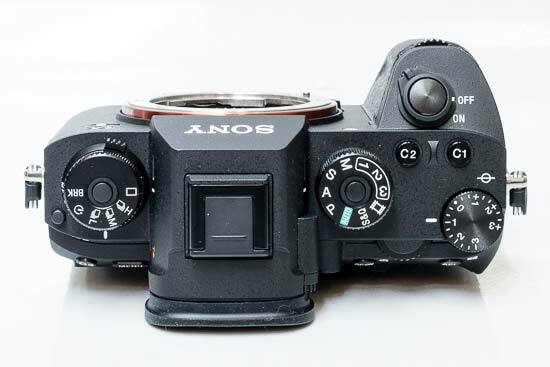 There are new separate buttons for AF-On and AEL, rather than the combined AF/MF and Auto Exposure Lock (AEL) switch/button as found on the A7R II, and underneath that a new AF Joystick, which is a very welcome inclusion indeed. Underneath that is the Function button which accesses up to 12 customisable options that appear on in two horizontal columns along the bottom of the LCD screen. The Function menu proves to be a very handy way to quickly change the A9's key settings and one of the main ways of setting the camera to suit your shooting style. The traditional round navigation pad can be used to navigate through menus and options, in conjunction with the small button in the middle which activates whatever it is you've chosen. Three of the four directions on the navigation pad can also be customised to provide a quick way of setting various options. The navigation pad doubles up as a control ring that's used to navigate through and set menu options, and usefully also has a setting to choose the ISO speed. The ring is a little small, but it's not too over-sensitive and the ability to take full control of the A9 is very welcome. Underneath the navigation pad is the Playback button, which gives users the ability to dip in and out of created folders of images or the calendar view, view thumbnails, select slideshows and choose transitional effects and accompanying music, or delete shots. Press the shutter button halfway and you're helpfully catapulted back into capture mode. And that's basically it. With a press of the Menu button in playback, users have access to a few in-camera retouching effects, including the ability to crop and sharpen an image and apply red-eye correction. Completing the rear of the A9 is the self-explanatory Delete button, which doubles up as the customisable C4 button. As denoted by symbols on the side of the camera, the Sony A9 is wi-fi and NFC capable and the functions can be adjusted in the Wi-fi main menu. You can choose to transmit the images to either a smartphone computer, or a compatible TV set. One cool feature of the wi-fi is being able to link the camera to your smart phone using the PlayMemories Mobile app. You can then use the phone as a remote so those outstretched arm 'selfies' will be a thing of the past. The A9 also features NFC (Near Field Communication) technology (the same technology that's used for mobile payments), which allows you to connect it to a compatible internet enabled device or another NFC-enabled camera by simply tapping them together. You can also use the WPS Push option to locate a hot spot, access settings, edit the device name, display the MAC address or format all settings if you wish. The A9 also offers location data acquisition via a Bluetooth connection to a compatible mobile device. In addition to the built-in wi-fi/nfc connectivity, the A9 supports PlayMemories Camera Apps. As the name suggests, this is a downloadable service that lets you add new functionality to the camera, either via wi-fi or USB connection. Smart Remote Control, which allows you to control the exposure and shutter release via your smartphone, is preinstalled on the A9. Other optional apps available include Picture Effect+, Bracket Pro, Multi Frame NR, Photo Retouch and Direct Upload, and Sony plans to provide more new apps in the near future. Note that only some of the apps are free. The bottom of the Sony A9 features a standard metal screw thread for attaching it to a tripod that's inline with the centre of the lens mount. A lockable plastic cover protects the lithium-ion battery, officially good for 650 shots, which is a massive improvement on the A9s predecessors. It's still a good idea to invest in a couple of extra batteries for an all-day shoot, and you can also recharge the battery in-camera via USB. The A9 can also use an external USB power source to charge it whilst still taking pictures, which is very beneficial for time-lapses or longer video clips. New dual memory card slots are housed within a compartment located on the right of the A9 (when viewed from the rear), with the A9 supporting the fastest UHS-II standard for the first time. Positioned on both sides of the A9 are prominent metal eyelets for attaching the supplied shoulder strap. On the left are three unmarked, sturdy plastic covers, underneath which can be found the Multi port, HDMI port, external headphone and microphone connections, and the brand new LAN/Ethernet port and flash sync ports.